College sports means big-time money for many of the top schools. Texas A&M recently topped the list of the schools that make the most money off of college sports, taking in more than $190 million annually. The chart below shows how much money the average Division 1-A school makes in various sports, according to data obtained from the Department of Education. To nobody's surprise, football is the sport that is most responsible for total sports revenue. For example, at the University of Texas, of their $184 in athletic department revenue, the football team is directly responsible for $121 million. However, the gap between football and the rest of the sports is jarring. While the average school generates nearly $30 million in football revenue, the next 25 sports combined (min. 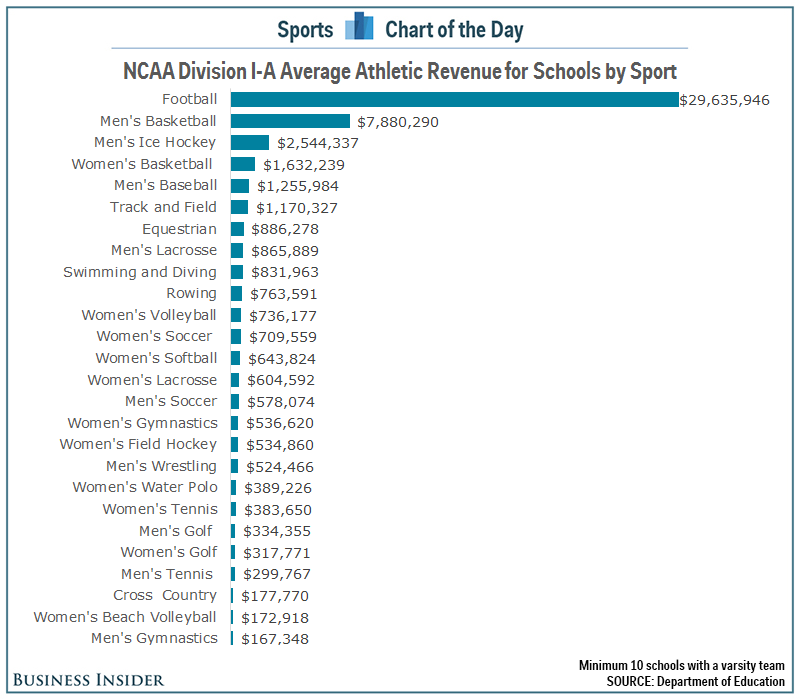 10 schools with that sport) generate less than $25 million combined.